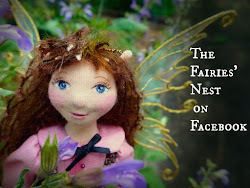 The Fairies Nest - OOAK Cloth Dolls & Fiber Fantasies: Witches! "By the pricking of my thumbs something wicked this way comes..." - William Shakespeare "Macbeth"
And their secret smile, out of the depths of the lake..." - William Butler Yeats "The Withering of the Boughs"
Well not too wicked. Meet Tabitha and Penelope. Two witches who personify the "trick" and "treat" of Halloween. Tabitha is all about the tricks. She can be a terrible nuisance; soaping cars, putting tangle spells on hair, spilling milk, and hiding keys or shoes...but there is one way to avoid her pranks. Because of her great love of pumpkins, she'll never play tricks on a home with a jack-o-lantern outside! 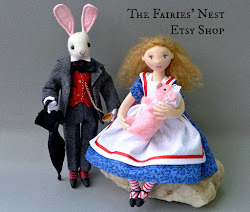 On the other hand, Penelope and her cat Poe are MUCH more interested in the treats and love to make all kinds of goodies for the neighborhood kiddies...the yummy kind because Penny is a Good witch! They live together despite their differences and figure between them they have all the Halloween bases covered. 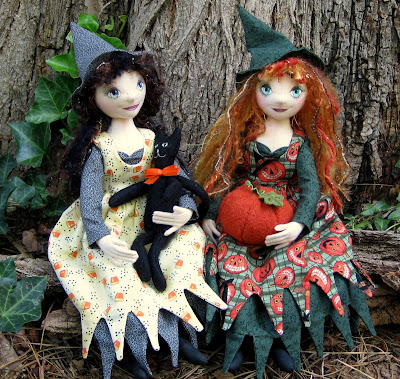 These wee witches are absolutely charming (no pun intended;-)!! They are both wonderful - as always! I can't decide which I like better - I'm torn. Penny has the great little cat, which I am enormously fond of, but I like the hair and the fab wool pumpkin on Tabitha. Very sweet looking witches, actually! I don't think they have a bad spell between them. Thanks for the advice. Turn tools and building character. It's all good. ahhh these are beautiful and makes me anxious for fall- do you know the song "there's a little witch in every woman today"- I know it more from a midwifery angle but these lovelies reminded me of that song! They are delightful! I love the trick or treat aspect of them too! 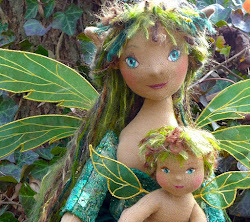 I love your little witch dolls - they are simply enchanting. And, of course, you made my day including Shakespeare.